Happy ho ho holidays! 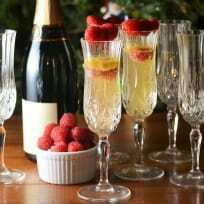 It's 12 Days of Cocktails this week here on Food Fanatic, and we couldn't be more excited. Let's stop and give a round of applause, shall we? It's definitely well deserved. 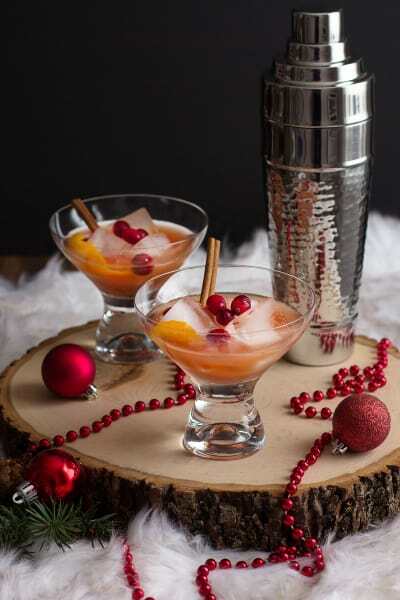 Cocktails were made for the holidays. Not only will you need one (or a few) in order to tolerate those out of town guests - and maybe the in-laws (wink) - but they sure do a damn good job at getting everyone into the holiday spirit. Holiday stress? Have a cocktail. Holiday traffic? There's a cocktail for that. The store was all out of that perfect gift because you waited until last minute? 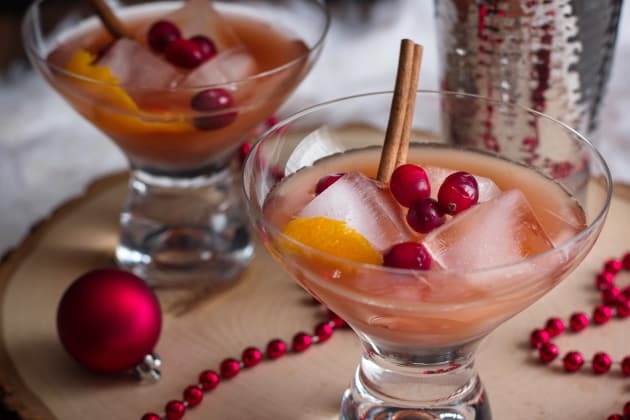 This Spiced Cranberry Rum Old-Fashioned will help you forget all about it. 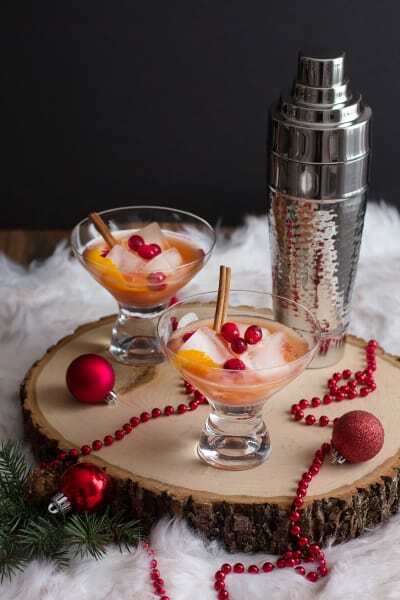 Cocktails are the cure-all during the holiday season. The best part? No prescription needed. I'm going to go ahead and deem the 12 Days of Cocktails an official holiday, and the best one at that! I'm having trouble choosing which cocktail I want to serve this year. 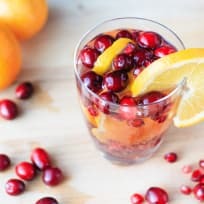 Do I pick this Cranberry-Orange Bourbon Smash? 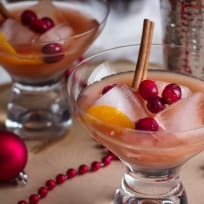 Oooh, or maybe this Pomegranate Cider Bourbon Splash. Notice a pattern here? I like-a the bourbon! Then again, wine is good, too! A pitcher of this Easy Apple Sangria would definitely please a crowd. You know what, I think I'll stick with this old-fashioned. A classic old-fashioned is made with whiskey, but since I'm not classy, I decided to switch it up and use spiced rum instead. 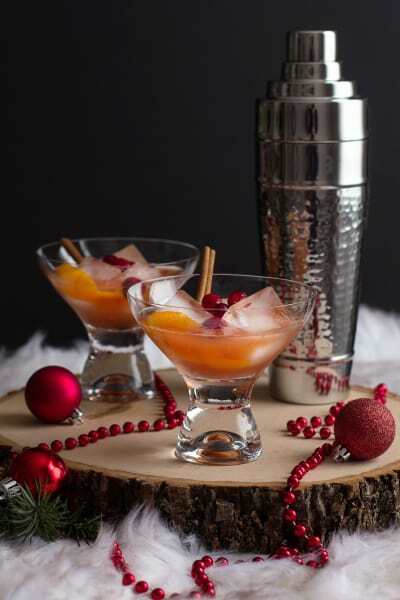 Because we could all use a little spice this holiday season, I added a few cloves and a cinnamon stick to the shaker, in addition to the rum and fresh squeezed orange juice. If you want to maintain some semblance of class, plop in a maraschino cherry. This is no wimpy cocktail, friends. 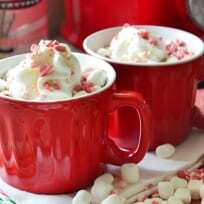 It's quite potent, which is exactly what I require during the holidays. Merry holidays, you filthy animals. Now, go forth and have some fun! 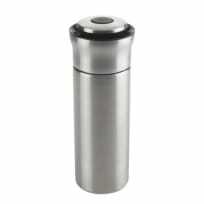 Add rum, orange zest, sugar, and bitters to a shaker. Muddle the ingredients until the sugar dissolves. Add the cranberry juice, cloves, and cinnamon sticks to the shaker. Shake vigorously for 30 seconds. Allow the mixture to rest for an additional minute to allow the cloves and cinnamon to infuse the rum. 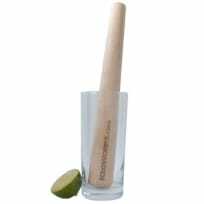 Add a handful of ice to the shaker; shake for 10 seconds. Strain the mixture into rocks glasses containing large cubes of ice. Garnish with remaining cinnamon sticks and orange zest.